Observations of Solar Dynamics Observatory (SDO) indicate that the powerful explosive processes in the Sun, solar flares, bring to the boundary of Earth’s atmosphere more than three times more energy than previously thought. Before the appearance of SDO solar flare energy was measured primarily in X-rays, with the help GOES satellites. According to this parameter flare can be divided into five classes, such as A, B, C, M and X. Minimal class A0.0 corresponds to the power of X-ray radiation on the Earth’s orbit in 10 nanowatts per square meter. In the transition to the next letter power increases ten times. 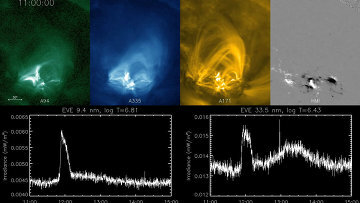 Solar Observatory, SDO is able to monitor processes on the Sun in several bands. Tom Woods, a space scientist at the University of Colorado, Boulder, Colo and his colleagues studied 191 solar flare that occurred since May 2010. As it turned out, about 15% of outbreaks were “long tail”, they continued a minute, and sometimes hours after that as the main phase of the outbreak ended. The existence of this late phase means that solar flares are thrown into space is much more energy than previously thought. At these later phase, scientists have found secondary peaks of energy release in other bands, in addition to X-rays. In the pictures were also found additional coronal loops, the flow of plasma along magnetic field lines. The obtained data can lead to significant overestimation of Sun’s energy.